With the season resuming this weekend, Maritzburg United is going on high drive to mobilise supporters to rally behind the team. The Team of Choice need their supporters more than ever before as Middendorp’s boys begin a battle to get out of the relegation zone. A competition was organised where emerging artists composed a song which will be a signature tune for the club. The song that will reverberate at Harry Gwala Stadium to drive both players and fans to a fighting mood each time there is a home game for the Team of Choice. 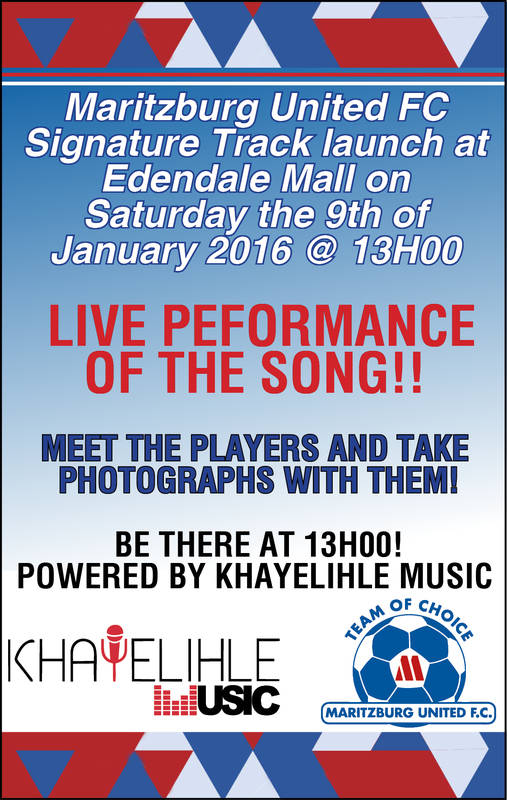 The winners who came up with the best song will be announced at Greater Edendale Mall this coming Saturday starting at 1.pm. The artists will perform the song live to the fans and shoppers. The brass band will lead a procession in music and dance , and MUFC players will also be there to sign autographs and take pictures with the fans. Signed replica jerseys are up for grabs as the whole mall erupts to the new song for the Club. Everybody is welcome. The event is powered by Khayelihle Music. BUY A COMBO TICKET AND STAND TO WIN AN MARITZBURG UNITED HAMPER. THREE HAMPERS UP FOR GRABS!! !